Newcastle United came to the unsurprising conclusion that it was not in their best interests to let their captain and key defender walk away for nothing. 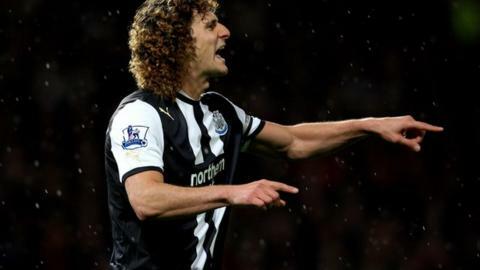 And so, for the next few months at least, Fabricio Coloccini remains on Tyneside. San Lorenzo, the Buenos Aires club he is desperate to rejoin, last week published an open letter allegedly written and signed by the Newcastle centre back. Its content is practically a declaration of love to the club's new leadership, who took over after presidential elections towards the end of last year. "Unfortunately," Coloccini also apparently writes, "not everything in life turns out the way one hopes or needs. Many times the lack of understanding of third parties and the rigidity of contracts are stronger than the reasons of the heart." Which boils down to the fact that there was no question of San Lorenzo paying a transfer fee. This is part of the explanation for the relative lack of interest in South America in the closing of the January transfer window. Fans in the continent will not be spending the next few days hanging on news of last-minute wheeling and dealing that might bring much needed fresh faces to their club. Much of this has to do with the calendar. This, after all, is the European mid-season window. But South American domestic campaigns came to a close in early to mid-December. New seasons are just getting underway now. The main business took place around the festive season. And, as the Coloccini experience shows, there is little hope of buying big names back from Europe. The movement in recent times has gone the other way. Local coaches often dread the last days of the window - it is a time when a European club could swoop, snatching away an important player and leaving his club with no time to look for a replacement. All of which makes developments in Brazil especially interesting. This transfer window has been something of a landmark for the country's big clubs. A few players have left but more big names have come back. World Club Champions Corinthians have repatriated striker Alexandre Pato and playmaker Renato Augusto, two highly rated young internationals, as well as centre back Gil. Sao Paulo have signed World Cup captain Lucio. Another veteran international centre back, Cris, has swapped Europe for Gremio, who have also captured Chilean striker Eduardo Vargas on a loan deal from Napoli. Another Brazil cap, winger or attacking midfielder Carlos Eduardo, is back from Russia to join Flamengo, who have also signed international midfielder Elias. The big Brazilian clubs can now pay transfer fees. Underpinning the change is the new global economic architecture. Dan Jones of Deloitte's Sports Business Group points out that "with large numbers of supporters and located in a growing economy, Brazil's big clubs are very attractive to commercial partners and are increasingly able to match many of their European counterparts in revenue generation". His colleague Richard Battle expects "the revenue of Brazilian clubs to grow, and it is possible that one will feature in the Money League top 20 in the coming years". He was commenting on the publication last week of this year's version of the annual survey which lists the clubs which make most money from their football operations. Corinthians have made the top 40, with Sao Paulo and Flamengo not far behind. "As Brazilian clubs close the revenue gap to many of their European rivals," concludes Battle, "they will increasingly be able to retain the best young talents and bring back established stars." It is a distinct possibility. But Brazil, as bossa nova maestro Tom Jobim pointed out with such clarity, is not for beginners. Everything is always more complex than it seems. Unprecedented revenue is indeed pouring into Brazil's big clubs. But many of them are also drowning in debt. Flamengo recently had to let striker Vagner Love go back to Russia - they were behind with transfer payments to CSKA Moscow. Deloitte has voiced its concern at the lack of cost control mechanisms in Brazilian football. Moreover, the economic boom is showing signs of slowing, and a consensus exists amongst economists that the local currency is overvalued - factors which could lead to a future reduction in revenue in relation to the European clubs. And there is also the crucial point, as recognised by Coloccini, that money is not everything. There are other motivations, which could be, as in Coloccini's case, the desire to represent a special club. But it could also be the desire for glory, to win the respect and admiration not only of a global public, but also of the world's other great players. And the place where this is done, and will continue to be done for the next few years, is Europe's Champions League. This explains why 20-year-old Lucas Moura has swapped an excellent Sao Paulo side for Paris Saint Germain - and also why the big names coming back are either coming towards the end of their careers, have run into injury problems or have not lived up to expectations. The quality of the national championship is improving, but the Brazilian calendar is blighted and needlessly cluttered by the existence of the obsolete state competitions, which run between now and the middle of May. And while South America's Copa Libertadores is a fine and hotly disputed tournament, it cannot yet truly compete with the quality on show in the Champions League. One of the fascinating questions in the next few years of the global game is how Brazil's big clubs choose to deal with this state of affairs. Do they really want to be global players? If so, they must clearly break with the power structure of their country's game, which, like an exaggerated version of pre-1992 England, is constructed on the interests of those who control the tiny clubs. For the time being, Brazilian football cannot compete with the Champions League. But a well organised, well marketed national championship has huge potential, especially once the 2014 World Cup stadiums are in use. People all around the globe would pay to watch it, as they now shell out for football from England and Spain. And stars in their prime might be moving both ways across the Atlantic in the transfer window. He's a 20-year-old Brazilian, who can play as a support striker, working the flanks, or as an attacking midfielder. I saw plenty of him on the way up, with Vasco da Gama, and I was always concerned that he was declared a wonderkid before he had actually done anything. During this time (2009/10) I also feared that at the top level he was a bit lightweight and one-footed (the right) to thrive at the top level. I haven't seen much of him since his move to Italy two and-a-half years ago. But it doesn't surprise me that much that he has struggled to make an impression - which is not to say that he's not capable of it. But there is such a huge gap between promise and reality, and so many fall through the crack. He still has plenty of time on his side, he has filled out physically and by all accounts he had a reasonable loan spell last season with new Southampton manager Mauricio Pochettino at Espanyol. I would welcome comments from anyone who followed his progress in Spain. He's nowhere near yet. Adryan was one of Brazil's flops in the South American Under-20 Championships, and at the moment he's another one who has a big reputation based entirely on promise rather than achievement. I'm not really sure that he has yet defined himself as a footballer. He's often used wide left cutting in onto his right foot. He strikes the ball well, but I'm not sure he's quick and agile enough to shine there at senior level.